Card #578 joins the Herschel Hoard. This is a 2008 SPX Winning Trios Jersey patch card of Herschel Walker, along with Jonathan Stewart and Matt Forte. This series depicted three football players and a swatch of jersey from each. 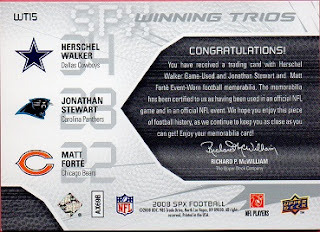 It was also a serial numbered card, of which there are 6 different versions. Serial numbered to 25(shown here), serial numbered to 49, a patch card serial numbered to 5, a card with no patches, just photos, serial numbered to 5, a patch card serial numbered to 99, and an autographed version. 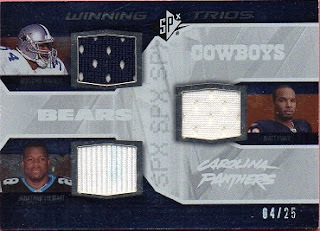 I have today's featured card, the "99" version, and the patch "5" card, in my collection. Top Ten Most Wanted Herschel Card Captured!